… Who is he? Why did he come? What does he require? That's what we are thinking through in our next mini-series. 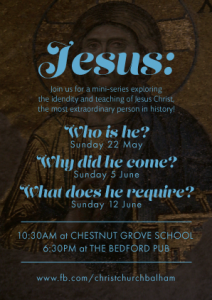 Come along, hear the talk and have a chance to ask any questions you like (hopefully related to Jesus!). We'll also be posting the talks on this site, so if you miss any you can catch up another time.